Google Australia launched Gday today, a new search engine that allows users to search content on the internet before it is created. “Google spiders crawl publicly available web information and our index of historic, cached web content. Using a mashup of numerous factors such as recurrence plots, fuzzy measure analysis, online betting odds and the weather forecast from the iGoogle weather gadget, we can create a sophisticated model of what the internet will look like 24 hours from now. Windows XP will stop being sold by computer manufacturers (Dell, HP, and the rest) on June 30, 2008. 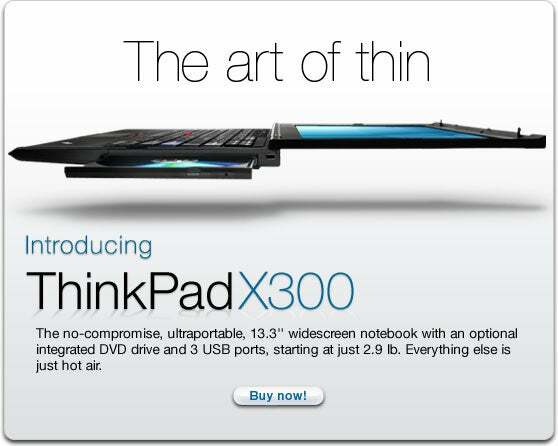 An effective ad from Lenovo to demonstrate that the Thinkpad X300 compares favorably to the MacBook Air. Windows Vista Service Pack 1 is available today through Windows Update. The products developed using Microsoft’s Windows Home Server software do a number of extremely useful things – backups, remote access, file and photo sharing, and file storage – using a very smart mixture of new and old technology. Here are some notes about Windows Home Server from last year. I can’t let the moment pass without acknowledging the loss of a dear friend. TALES OF WOE: SOFTWARE DEPT. TALES OF WOE: HARDWARE DEPT. FolderShare, Microsoft’s invaluable free utility for syncing and sharing folders among multiple computers, has gotten a long overdue upgrade.